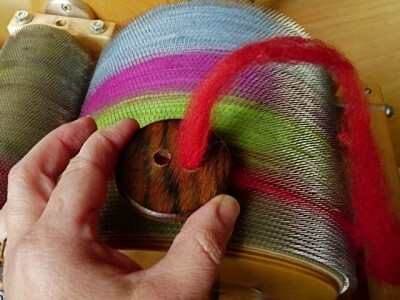 I took a quick drum carding class from Sarah Anderson this winter and one of things she demonstrated was dizzing off of a drum carder. I tried it and it’s fun and easy. 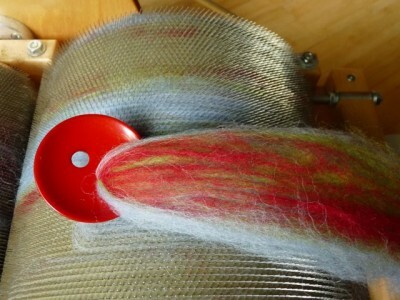 Perfect if you love drum carded fiber , but don’t like spinning from batts. You need a drum carder (mine is a Patrick Green Deb’s Delicate Deluxe), a doffer (the pointy ice-pick-looking tool) and a diz (I use buttons. I love buttons). Build your batt. I did a quick striped batt for long color runs. Start by doffing just enough fiber to fit through your diz. And thread it through your diz. Start dizzing by pulling the fiber slowly but firmly through the diz. 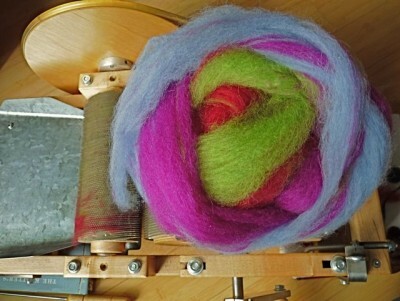 Try tipping your diz at a slight angle to the drum carder. 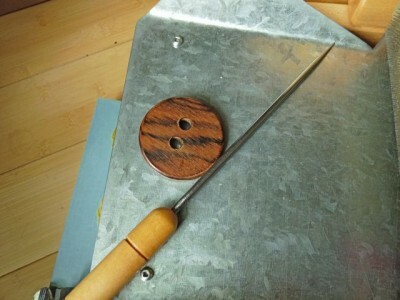 If you use a button as a diz, don’t use one with a shank on it. The fiber will wrap around it no matter how careful you are, or how many bad words you say. If the fiber is hard to pull through your diz your fiber is too thick. 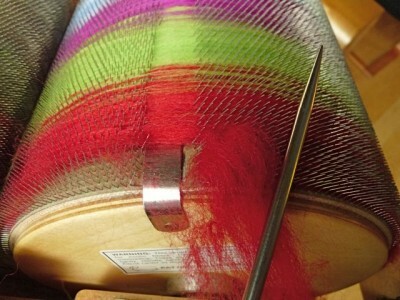 Keep your hand between your freshly dizzed fiber and the drum carder, or it will catch back onto the carding cloth. Ask me how I know. If your fiber breaks or gets very thin, just doff the next little piece and start again. 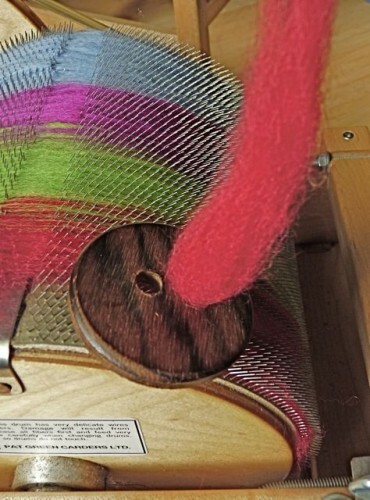 Don’t expect the pull of dizzing the fiber to turn the drum on your drum carder. I turn my drum a quarter of a turn, diz, then repeat. The fiber will pull off of the drum in a giant spiral, like peeling an apple. 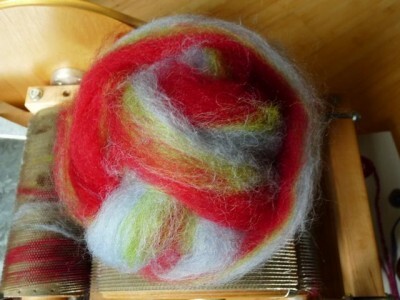 The resulting roving is gorgeous, fluffy and ready to spin. Use the exact same process to diz layered batts. The roving comes off blended. Fun, easy and a great excuse for me to buy more buttons. Here’s something I figured out about storing my drum carder recently. 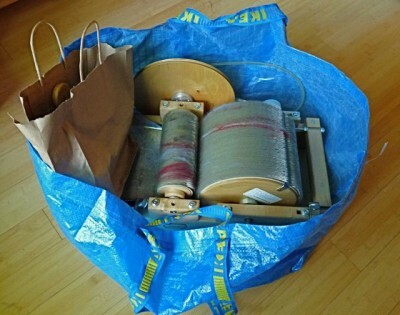 It and all the carding tools fit perfectly into a big blue Ikea shopping bag – it’s the perfect storage solution for me. Everything in one place and the bag makes hauling it off and on the shelf where I store it easy. Thanks so much for this great idea! I’m off to try it!! Tha nks for sharing this neat technique! This is great, thank you. I had tried diz off my DDD a few times with no luck. This helps tremendously. Off to card some batts! I am totally trying this. Love the layered batt dizzing! coolio. …and thus you filled my rainy day with glorious color and productive mutation of many odd leftover bits into gorgeous fluffy roving. Thank you thank you thank you!